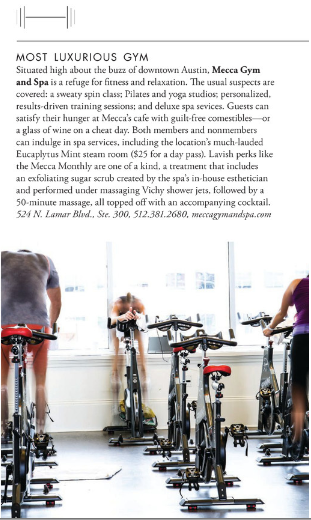 Situated high about the buzz of downtown Austin, Mecca Gym and Spa is a refuge for fitness and relaxation. The usual suspects are covered: a sweaty spin class; Pilates and yoga studios; personalized, results-driven training sessions; and deluxe spa services. Guests can satisfy their hunger at Mecca’s cafe with guilt-free comestibles - or a glass of wine on a cheat day. Both members and nonmembers can indulge in spa services, including the location’s much-lauded Eucalyptus Mint steam room. Lavish perks like the Mecca Monthly are one of a kind, a treatment that includes an exfoliating sugar scrub created by the spa’s in-house esthetician and performed under massaging Vichy shower jets, followed by a 50-minute massage, all topped off with an accompanying cocktail.